Castings starting at 1 kg and up to 4,000 kg are possible. We can integrate the entire process, from pattern-making to casting to machining. In the pattern-removal casting process, the pattern (either wooden or styrene foam) is placed in a metal frame and sand is used to create a mold around it. After the pattern is removed from the mold, a core is placed, and the sides of the mold are fit together, molten metal is poured into the mold. The cast piece is removed from the sand for completion. Height/Width: Varies according to shape. Please contact us. We can also cast long objects. Some tall objects may also be possible. Retained Die Size: (minimum) 550 mm x 550 mm; (maximum) 2,400 mm x 2,400 mm; All kinds. Delivery Time: Varies according to shape. Please contact us. We can also handle integrated pattern production and machining. 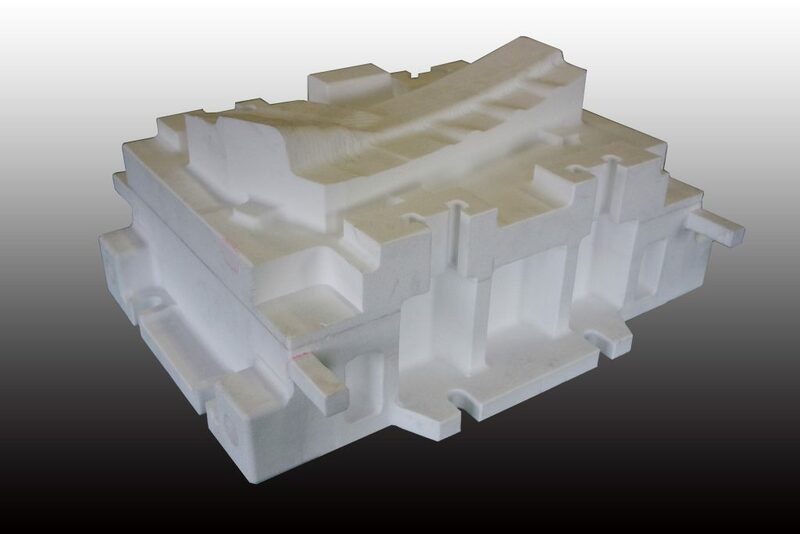 We can integrate the full process in-house, from the manufacture of the styrene foam pattern to the initial processing of the cast object, metal component processing, and machining We are confident in our machining techniques. Manufacturing styrene foam patterns in-house,even complex forms difficult to do using pattern-removal casting. 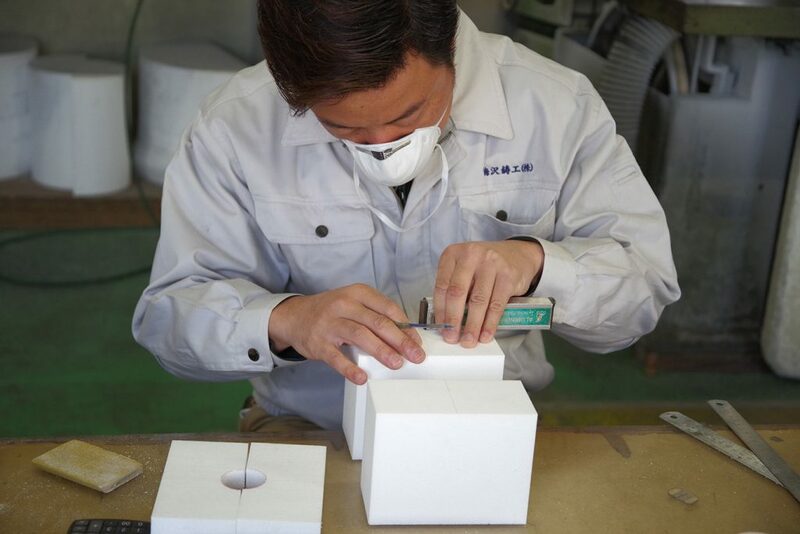 In the full mold casting process, a pattern is created with styrene foam (a lost-foam pattern) and placed in a form. This method creates the cast object through the replacement of the pattern with molten metal as it is poured. For this reason, it is also known as the “lost-foam casting process.” Unlike the pattern-removal casting process, no core is required; this allows for a shorter delivery time and a reduction in cost. The full mold casting process is the most commonly used in the field of press die materials. It allows for a reduced time required to deliver a casting and for lower costs. This process is coreless, so it omits time-consuming processes from the course of patterning → coating → drying → molding → pouring. Reducing production processes shortens the time required to deliver and reduces costs. Complex forms that would be difficult with pattern-removal casting can be produced at lower cost. Because there is no need to join together a core and because a styrene foam pattern can be created in exactly your desired shape, even complex forms can be cast at a low cost. Residue may appear on the surface of the casting. Carbon from the styrene foam pattern often remains as residue on the surface of the object. Preventing the appearance of residue is a challenge due to the newness of this technique. For more details, please reference our page about Creating Styrene Foam Patterns. Creating a prototype using a styrene foam pattern may incur a fraction of the cost compared to a wooden pattern. Styrene foam offers the advantages of superb workability and ease in modifications to its form. It also enables a shorter time to completion. We can manufacture castings of FC (cast iron) or FCD (ductile cast iron). When using styrene foam, the cost of producing patterns can be reduced to about 1/5th compared to wooden patterns if the number produced is 5 or less. However, we will recommend the use of wooden patterns if their use would be less expensive due to the form or volume you require. While wooden patterns may be a fixed asset for the customer depending on their price, styrene foam patterns are regarded as disposable, which may be an advantage. We produce our styrene foam patterns in-house, giving us flexibility and allowing us to reduce time required for delivery. Because styrene foam is so workable, we can produce prototypes with multiple revisions to the form, and the more revisions you make, the greater the advantage in cost reductions. We leverage the advantages given above to handle the production of one-off pieces and small lots. Copyright©Umezawa Cyuko Co.,Ltd.All Rights Reserved.